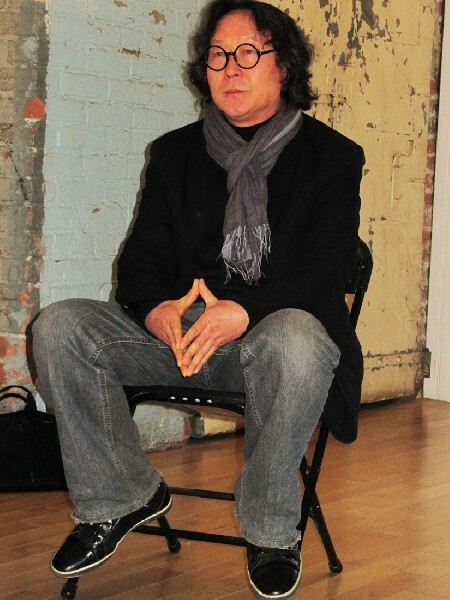 The artist Xu Bing will discuss his work at Mass MoCA. Giuliano photos. The two metal birds of Phoenix suspended above the space of cavernous Building Five. Xu Bing will deliver a public lecture about his work on Friday, April 26, at 5pm in MASS MoCA's Hunter Center. 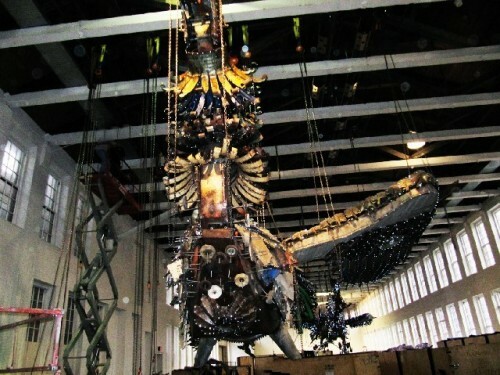 At the focal point of this landmark exhibition are two monumental birds fabricated by migrant workers using debris from construction sites in Beijing’s financial district. Addressing tensions between modernity and tradition, wealth and poverty, capital and labor, the massive sculptures incited controversy in China for highlighting the social and cultural consequences of the country’s rapid development. Joining the Phoenix Project on Saturday, April 27, are three additional installations, all focused on the artist’s continuing interest in language. The new installations include large format pen and ink drawings from Xu Bing’s Square Word Calligraphy series; his first hand-drawn animation, the 50’ wide, 17-minute The Character of Characters (2013) portraying the history of Chinese writing; and Book from the Ground, Xu Bing’s research project about international communication through pictographs, symbols, and computer icons. A reception with the artist will follow the lecture at 6pm in the Xu Bing: Phoenix gallery. The lecture is free to MASS MoCA members and the Williams community, $8 general admission.